Risk aversion intensifies in Asian session again. In particular, Hong Kong stocks lead the decline on news of arrest of Chinese tech giant Huawei’s CFO Meng Wanzhou. The arrest is reported to be in relation to Huawei violating US sanctions by shipping US originated products to Iran and some other countries. Canada also confirmed that Meng is facing extradition to the US. The arrest also prompted concerns over Chinese retaliation on US executives. At the time of writing, Hong Kong HSI is down -2.62% or -702 pts. Nikkei is down -2.13% or -468 pts. China Shanghai SSE is down -1.28%. Singapore Strait Times is down -1.13%. 10 year JGB yield is down another -0.25 at 0.045. We’d like to point out again that 10 year JGB yield hit as high as 0.166 just back in early October. Considering the slump in US and German yields, the strong bond market rebound and stock market decline, it’s clear that funds are seeking safety in rather drastic manner. In the currency markets, Australian Dollar remains the weakest one for today, followed by New Zealand Dollar. Canadian Dollar isn’t much better as the third weakest. The Loonie was sold off sharply after BoC expressed its concern on “oil price shock” in the statement overnight. For now, Yen is the strongest one for today, followed by Swiss Franc and then Dollar. Technically, USD/CAD is likely in medium term up trend resumption. We’ll see if it can sustain above 1.3385 key resistance to confirm. CAD/JPY’s firm break of 84.61 support already confirm resumption of fall from 89.22. Outlook in Australian Dollar is starting to look bad. 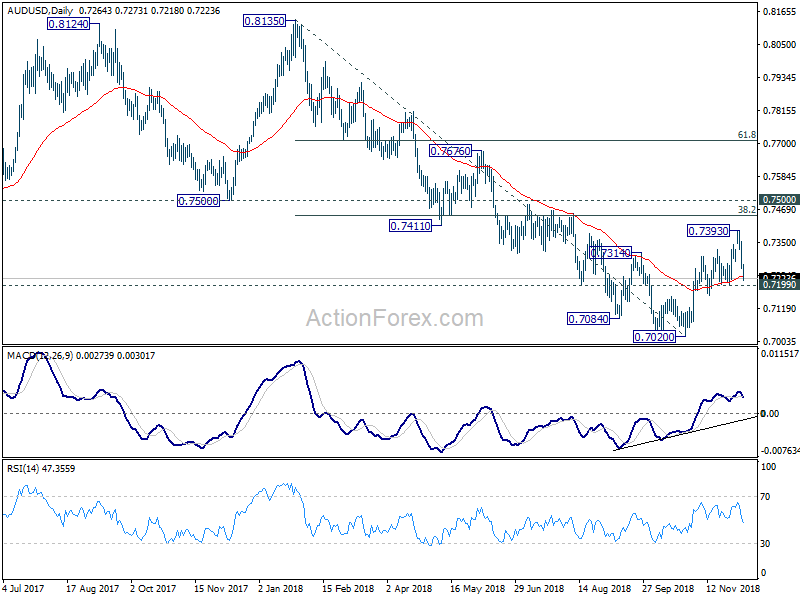 AUD/USD is heading back to 0.7199 support and EUR/AUD is eyeing 1.5781 resistance. Break of these levels will argue that recent rebound is Aussie is finished and turn outlook bearish again. Meanwhile, EUR/USD, USD/CHF, GBP/USD and EUR/GBP are trading in familiar range. These pairs are still awaiting breakout. Canadian Dollar dropped sharply yesterday after BoC kept overnight rate target unchanged at 1.75% as widely expected. But the central bank sounded rather concerned with recent slump in oil prices. Depending on the developments, further weakness in oil price could lead to downward revision in growth projections, slower rate hike next year, or even a pause. Sterling is one of the weakest currency this week, just next to risk aversion pressured commodity currencies. But downside in the Pound is so far limited, except versus Yen. It’s believed that odds are stacking against UK Prime Minister Theresa May winning the parliamentary vote on Brexit deal on December 11. Her performance in the first two days of the five-day parliamentary debate hasn’t been satisfactory so far. According to a Reuters poll, economists forecast that Sterling would appreciate 3.5% if the deal is approved next week. On the other hand, rejection could trigger selloff by -2.75%. But we’d like to emphasize the eventual development if rather unimaginable. May’s defeat in the Brexit vote might not lead to no-deal Brexit, but no Brexit at all. After all, the UK has a trump card of withdrawing the Brexit request unilaterally. Anyway, for now the Pound’s movement could be relatively limited as traders would refuse to commit to any position before the vote. Australia trade surplus came in smaller than expected at AUD 2.32B in October. Retail sales rose 0.3% mom in October, matched expectations. Germany factory orders will be featured in European session. Later in the day, Canada will release trade balance and Ivey PMI. US economic calendar will also come back to life. Trade balance, jobless claims, non-farm productivity, ISM services and factory orders will be featured. 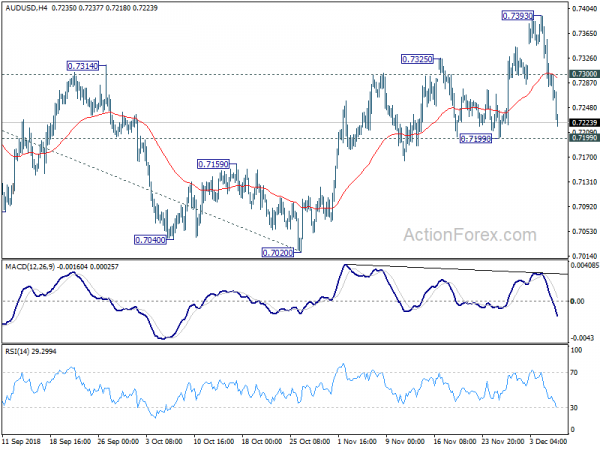 AUD/USD’s fall from 0.7393 accelerates lower today and focus is now back on 0.7199 support. Firm break there will suggest that the corrective rebound from 0.7020 has completed earlier than expected. Deeper fall should then be seen back to retest 0.7020 low. On the upside, above 0.7300 minor resistance will turn bias back to the upside. In that case, corrective rise from 0.7020 would extend to 38.2% retracement of 0.8135 to 0.7020 at 0.7446 before completion.